Welcome to the Viking Jewellry - Viking Arms and Armour website! of weapons and armour in steel, we can provide weapons, armour and equipment in other materials. For instance, when supplying for film/television and the LARP scene, we offer products in modern materials such as aluminium, on request basis. and the remaining items are manufactured under license, exclusively for us. Our authentic ranges are made correctly and with attention to materials used. Viking Jewellry.com offers armour and weapons including Paul Binns swords and VikingJewellry.com exclusive Viking helmets and armour. Our range has been put together to help anyone with an interest in the Viking Age. (Saxon, Roman, Classical and Medieval, too) we hope you find what you're looking for here. it's just the question of time and the budget available. I have spent 25 years as a recreational modern-day Viking. 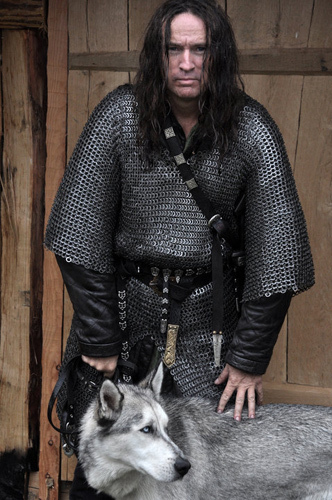 I travel extensively – visiting, taking part in and organizing international Viking events all over the world. I'm involved with the world's largest international Viking Age organization, The Brotherhood of Jomsborg headed by The Jomsvikings. I take pride in researching and producing specialized and detailed props. a broad and useful range. Most of the site product is permanently IN STOCK!